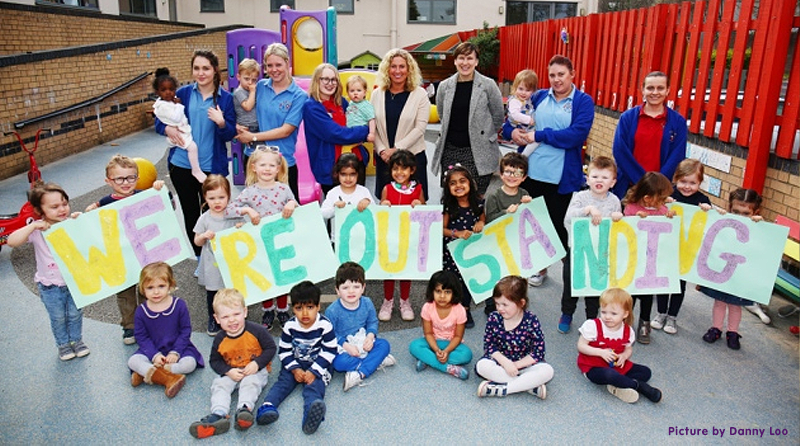 Wonderland Day Nursery in Letchworth, Hertfordshire, has been awarded the highest rating by Ofsted on two consecutive visits, the first one being in 2013. The report says: “The management team consistently reflects and evaluates on the quality of the provision to ensure excellent outcomes for children are maintained. “Managers promote the wellbeing of staff and provide high-quality supervision, training and guidance to support them in their role. “Staff have excellent knowledge about their responsibility to safeguard children. They clearly demonstrate their understanding of what to do should they have any concerns about a child’s welfare. “Activities are targeted particularly well at supporting children to build on their individual skills and abilities. “Staff take every opportunity to develop and extend children’s communication and language skills. “As a result, all children, including those who speak English as an additional language, become very confident communicators. “The caring, family atmosphere of the nursery enables children to feel exceptionally secure and happy. “They form close bonds with their key person and there are highly impressive relationships between all staff and children. Babies receive individual attention and enjoy cuddles and comfort in familiar and attractive surroundings. The spokesperson for Wonderland Day nursery said to local news outlet, The Comet: “Wonderland has a reputation for exceptional care and a family feel in the nursery that has been established over 24 years in Letchworth. “We are happy to say that Ofsted has once again awarded us ‘outstanding’ and we are all delighted.